'Grandma', we called her. The name that brought butterflies to our tummies whenever we heard she was visiting. No doubt we were interested in the sweets and biscuits, but more than that we were interested in the sincere love and care she brought home. We saw it in her eyes, her smile, her gentle touch as she patted our backs one by one and in her gift of Naira notes labelled for each one of us proportionate to our age and level in school. Grandma was the meekest person I’ve ever known. She was quiet in spirit. I never heard her complain though there were many reasons to. From mosquitoes that bore through weak bed nets, the beast heat from the east giving more exercise than rest at night, her oatmeal “swallow”-turned-porridge due to someone’s culinary incompetence to pension delays and all what nots. She was a woman of God. We knew not to knock on her door in the early hours of the morning, but even at times in the afternoon, we met her staring down her glasses on her leather jacket Bible. It goes without a saying that she was a good mother for whoever taught my mother the values she passed down to us must have been good. 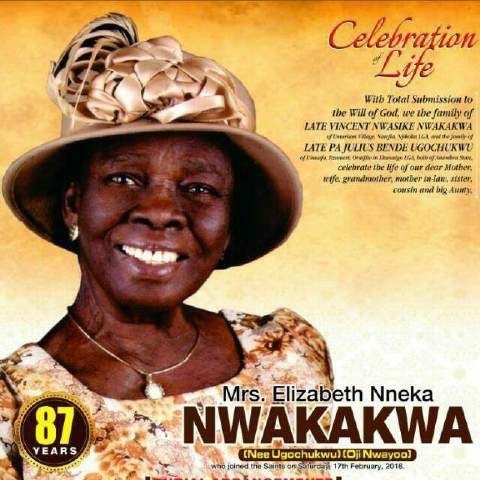 Today we celebrate a life well lived, we mourn not as them without hope, but we know that if we follow the examples she gave us we will meet again where there are no pension delays, no mosquitoes, no sickness to hurt our bodies and certainly no death to separate our loved ones from us. Adieu Grandma. See you in heaven.